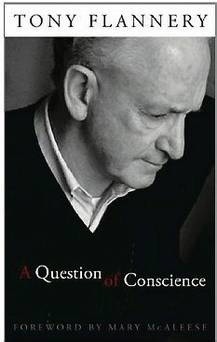 A couple days ago I finished reading A Question of Conscience, written by the well known Redemptorist Tony Flannery, with more than 40 years of service to the Catholic community in Ireland. The book chronicles Flannery’s painful journey since February 2012 when he was ‘silenced’ by the Vatican. That’s not long ago! He was forbidden from publicly presiding at Eucharist, hearing confessions, conducting retreats, leading novenas or otherwise practising his ministry as a Roman Catholic ordained minister. One of the best-known and most-valued Catholic ordained ministers in Ireland, a man regarded with respect and affection by a great many Irish Catholics has now been stopped in his tracks. Why did the Vatican silence him? Because of Tony Flannery’s work as a founding member of the Association of Catholic Priests (ACP). and some offensive-to-Cardinal-Levada passages in articles he had written for the Redemptorist magazine Reality. Cardinal Levada’s CDF — Pope Benedict’s CDF — crushed Father Flannery, using secret machinations right out of a Renaissance horror story. In his articles he expressed theological questions and positions that in fact are held by most of today’s internationally respected Catholic theologians. Now…… the question remains: Will the CDF under the current Bishop of Rome be just as secretive, Machiavellian, and cruel? Climate Change in the Catholic Church? “…stopped in his tracks.”? This is true only if he chooses to hand over complete control of his life to the Vatican and the hierarchy. I understand the consequences to him if he doesn’t. But, what about personal integrity and honoring one’s informed conscience. We liberals say our conscience is primary but buckle to the pressure of the Vatican and the hierarchy when it’s challenged. This situation, and many like it, make me feel ever more strongly that there MUST be an independent Roman Catholic church. Rome needs to learn that they are not the only show in town. We, dissenting but conscientious Roman Catholics, must not allow the Vatican and hierarchy to bully us and steam-roll over us. If we do, we deserve what we get! Well said. I’m with you all the way on that stance. Since reading this posting I have pre-ordered this book. Reading “Shattered Vows: Why Priests Leave” by David Rice was eye-opener enough on these cruel, underhanded tactics of the top echelons of clergy. Any person or institution which practices or condones silencing of conscience is a) not doing the work of Christ, b) committing the “unforgiveable sin against the Holy Spirit”- the Spirit of Truth which brings awareness of what is right or wrong and what could be if acted upon. To stifle this is totally shameful. I am not optimistic about Francis doing anything differently. We seem to have reached a stage where the interests of the institution supercedes that of its Founder. Time to rethink the whole shebang. I really do hope Francis will be good news. Right now I have more questions about what is really going on….. Yes, me too Jack. I am watching like a hawk and researching quite a lot about stuff that’s alleged to have gone on in the Vatican. Something definately doesn’t feel right to me. The blatant hypocrisy regarding the treatment of homosexual people and the total dismissal of women wont wash for a start. Not to mention the hypocrisy involved in the welcome of protestant priests and their wives while Catholic priests are still having celibacy enforced upon them. The motives for this are pretty obvious- keep women out of the clergy. What are they afraid of? I really would like to see Francis as a breath of fresh air and a positive change agent. I still don’t see the whole picture. I’m sure we would all like to but we have to see what is there not what we wish were there. How long does he need to make a few simple changes? How long are we going to wait and hope and this time next year, nothing has altered? How long has this situation been going on? A VERY long time by the look of things. Meanwhile the suffering goes on…. I want to see three things: (1) what happens when he has met with his eight special advisors, many of whom have strong Opus Dei links and (2) what kind of men he appoints as bishops and (3) how the CDF deals with contemporary, historical critical theologians. Jack, bear witth me please. I am a convert of 4 yrs from U.K., not a cradle catholic from USA like yourself. What does CDF stand for? As a recent convert however, I also have an advantage inasmuch as I am perhaps not as blinded by familiarity. You can call this naivete perhaps. Alternatively you can view this as a fresh, unbiased and possibly clearer view. I have a question to ask: Who exactly IS running this Church, the Pope, supposedly God’s representative on earth, or his special advisors? Why does he need advisors ( Opus Dei linked or not) if he has a direct line to the Almighty? My reactions as a naive ( or innocent) convert to all this hype and the crumbs of public relations gestures we’re being fobbed off with is this: The Emperor has No Clothes. Spirit that animates all members of the community of faith. I don’t believe the pope has any more of a direct line to the Almighty than you or I. As an institution, the church needs governance which is best done by men and women collaborating together. I would hope that the pope’s exercise of leadership would be more collaborative. Many thanks for your info and your views. I too think it should be run in a democratic way, not as a dictatorship by a few who have not been elected by the people of God. but the fact remains, it isn’t and the dogma of Papal infallibiity is still being bandied about. Things need to be a lot more clearcut.However we still hang on to the hope that a new Pope will change things even when he can’t really can he? The fact is we are still at the mercy of a few who don’t tell us what is going on. Thanks again Jack.